Ms. Ruma Devi comes from a village in Barmer. She dropped out of school in 8th class because she had to contribute to the family income. She started doing embroidery work, which was the start of Ruma Devi’s journey towards women empowerment. 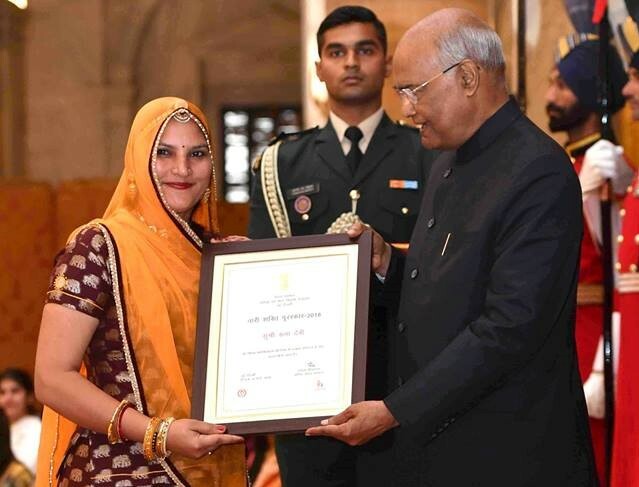 On March 8, 2019, Ruma Devi conferred the Nari Shakti Puraskar by HE Ram Nath Kovind, President of India, for her work at Gramin Vikas Chetna Sansthan (GVCS). Born with natural leadership and power within, Ruma Devi has been fighting for the rights of the artisans by helping them form a self-help group (SHG). The group secured bank loans and began procuring raw material itself. Ruma Devi and her SHG colleagues then joined GVCS, an not-for-profit in the region, and she soon took over as its President. She started encouraging other women to take up embroidery and made them aware of their rights, fair trade and wages. It also became platform for her to address social problems like child marriages, domestic violence, malnutrition, girl child education. As President of GVCS, Ruma Devi is helping women artisans to upgrade their skills and develop entrepreneur skills. Under her, GVCS has expanded operations to 75 villages and trained 11,000 artisans so far. Nari Shakti Puraskar (Women Power Award) is the highest civilian honor for women in India. Instituted in 1991, the award is conferred by the President of India every year on March 8 at New Delhi, on the occasion of International Women’s Day. The award carries a cash prize of rupees one lakh (Rs. 100,000 / € 1275) and a certificate. It recognizes the spirit of courage of a woman in difficult circumstances, who has established this spirit in her personal or professional life. The award also recognizes the pioneering contribution of an individual in empowering women and raising women’s issues. Women on Wings and GVCS started collaborating in 2015. Since then the two social enterprises have been working on the creation of more employment opportunities for women artisans. The Women on Wings team has witnessed the driving force of Ruma Devi on various occasions over the years. From exhibitions, to workshops and Women on Wings’ 9th anniversary celebration during which Ruma Devi, Durga Yadav and Kajodi Devi, two other last mile beneficiaries from Rajasthan, were present to share how having a job and income changed their lives. These women proof the role of women in shaping the society, and importance of economic independence, which in turn leads to a better future for the next generation.